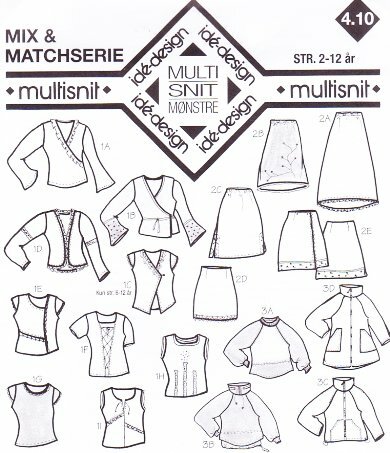 Model 1 New blouses with many variational options og oppertunity to use lace decoration. The pattern is drafted as whole front and back pieces, which leaves plenty of chance for using asymetrical details and wrap-around models. Model 2 Skirt pattern with optinal variation. Model 3 Raglan pattern for jacket, coat and oversize shirts. Model 1 Designed for stretch fabric, since the fitting is relatively snug. Model 2 A-B-C have elastics in the waist and should be made with stretch fabric. D-E can be made with woven and non-stretchable fabrics. Model 3 For both stretch (fleece) and non-stretch (woven) fabrics.